While organic pomegranates’ share of category sales is small, it is growing. Sales grew by almost 72% in 2016. Include pomegranates in your organic mix during their short sales season to boost your profits. This commodity is not typically marketed by variety. Include organic pomegranates in juicing promotions as the juice is popular with consumers. Organic pomegranates can also be included in salad promotions and cross-merchandised with organic bagged salads and dressings. Organic pomegranates have a similar availability window to conventional, with the most supplies available from October to January. This matches up well with the winter holidays. With their bright red color, organic pomegranates make a festive addition to any meal. Include them in holiday promotions. Consider offering samples to familiarize consumers with the taste of pomegranate. Use the sampling time as an opportunity to discuss the organic growing practices with consumers. Organic pomegranates have a short availability window so make the most of it. Create eye-catching displays by pairing organic pomegranates with organic persimmons. You can also display organic pomegranates next to their conventional counterparts to make a larger display. Just be sure to use the proper barriers between the two types. Organic pomegranates are not as sturdy as they look. Too much weight will cause the pomegranate to crack, so avoid stacking them. Many consumers may not be familiar with pomegranates, so include preparation tips and recipes in your display. Organic pomegranates come in a variety of pack sizes, similar to conventional product, including tray packs and euro boxes. 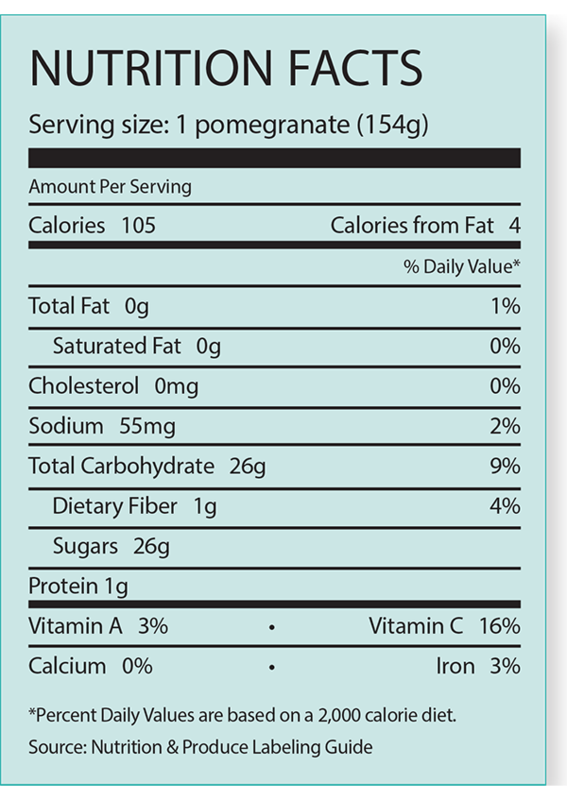 Pomegranates are subject to no official U.S. grade standards. Susceptible to chilling injury if kept below 41 F (5 C). 16% of consumers who purchased pomegranates exclusively purchased organic pomegranates. Another 21% of those who purchased pomegranates bought both organic and conventional pomegranates.